Kits, Plans, Canopies, Decals & Etc. Photo Gallery, Links, Hints, Etc. Welcome to Diels Engineering, Inc.
See Dave's blog for the owners latest comments. Last update January 10, 2019. EFFECTIVE IMMEDIATELY SHIPPING AND HANDLING CHARGES HAVE CHANGED. SEE ORDERING INSTRUCTIONS PAGE FOR NEW PRICING. ****ONLY ONE F4U KIT # 13 LEFT. FIRST COME FIRST SERVED. $34 EACH PLUS S&H. LAST CHANCE. ****CLICK HERE FOR DETAILS. SEVERAL KITS ARE IN VERY VERY SHORT SUPPLY. CLICK HERE FOR DETAILS. PLASTIC MODELS PAGE. 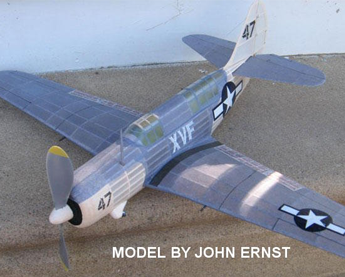 PLASTIC MODELS ORIGINALLY PURCHASE FOR REFERENCE MATERIAL TO AID IN DESIGNING FLYING MODELS. THESE MODELS ARE NOW FOR SALE AS THEY ARE NO LONGER NEEDED. CLICK HERE FOR THE LISTING. Check out Dave's blog for the owners latest comments. Check out the New Laser Cut kit line for new additions. Paper Catalog Click here to print or save a pdf of our latest "paper" catalog. Also visit the Misc For Sale page. Our address is Diels Engineering, Inc., P.O. Box 167016, Oregon, Ohio 43616 U.S.A. In the kit business since 1986, Diels Engineering, Inc. manufactures and sells free-flight, rubber-band powered model airplane kits (both complete kits and short kits), plans, and related accessories. We specialize in high-quality, craftsman-type model kits of military aircraft (with a few exceptions) from various nations. The current product line contains a selection of well-known and less well-known types primarily from the 1920-1950 period, many of which are not available in kit form from any other source. Most kits are designed to 1/24 (1/2" = 1') scale . We also have a few peanut scale (13" wingspan maximum)kits and a line of peanut scale plans. TO ORDER USING PAYPAL GO TO THE ORDERING INSTRUCTIONS PAGE BY CLICKING HERE AND THEN CLICK ON THE PAYNOW BUTTON NEAR THE MIDDLE OF THE PAGE ABOVE THE PAYPAL LOGO. CHECK OUR SPECIAL OFFERS PAGE FOR CURRENTLY RUNNING SPECIALS.CHECK OUR NEW AND CURRENT PRODUCT NEWS PAGE FOR INFO ON NEW PRODUCTS OR CURRENT PRODUCT AVAILABILIITY.